Here is the sketch for Saturday November 24th. 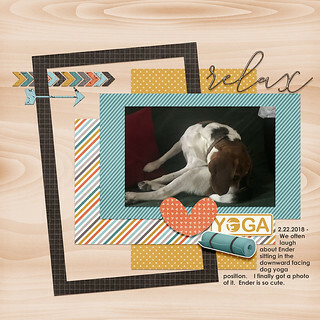 Everything taken from the Digital Scrap Parade Tranquil blog hop. If you are part of the team challenges this month, create a Relaxing page with this sketch (colors or topic) for an extra 5 points. Great sketch, LisaDV! I love all the overlapping tilted mats, and that off kilter frame. Awesome page, too. Great colours: I love blues and browns together and that gold gives it just the right amount of pop. Love the title! I am behind in this month's sketches, but I really want to get some of them completed over the next few days. Like grammadee, I am way behind, I don't think I've done any Nov sketches and I want to do some.... the mojo is not flowing though unfortunately. I can do a weekend in December. Just find a sketch and make an example? I love the page Lisa! It reads relaxing to me for sure. It’s a nice simple sketch to that will either keep me simple or allow me to customize more. I’m excited to try! Awesome! I have December 1st booked. kiwigirl, are any of the other December Saturdays taken? Thanks for the sketch LisaDV , it's a ripper! This is my take on it. I used the "Summer Is Here" kit by Lindsay Jane. Ok I'll take December 8th! My contribution... 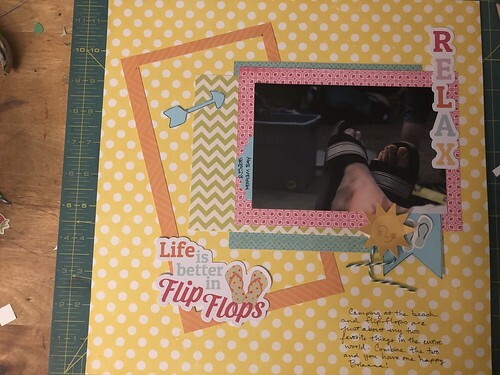 I saw the sketch and this photo I've been meaning to scrap and the ten or so "life is better in flip-flops" items in my stash came to mind. Everything went together really easily until I couldn't find an arrow in my stash that wasn't tiny. 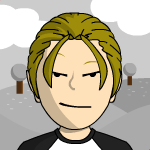 I ended up cutting one with my Silhouette and the tab and banner so they'd all be the same color. This seems like it needs to be backed on cardstock, I might do that before I put it away in an album. AussieMeg, I totally responded to your layout the other day, but now I don’t see it. I’m not sure what I did. It’s beautiful! I love the colors, the curly ribbon, and that photo! It’s a beautiful beach. The layout makes me think of summer and relaxing both. 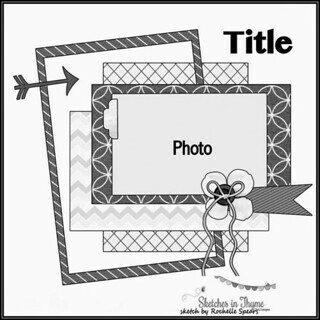 breetheflea, what a fun idea for a title and layout! Love that! Your colors are so bright and happy. I now want a flip flop page even though I’m not really a flip flop girl! Feels good to be back to my everyday scrapping and able to participate in some challenges after several months of wedding pics, travel, holidays, and putting my house back together after a big renovation. I love sketches so I'm starting with this one and breaking open a new kit. elaynef, what a fantastic page. I love the muted color abd the large photo. Love it, elaynef! Great masculine page. Love how the beige/kraft highlights the colour of his jeans. And great job adjusting this sketch to your page shape. elaynef love your take on the sketch!! 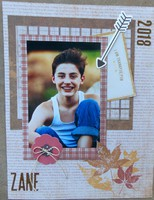 i really like that background paper and how you tucked the photo cluster under the leaves, and the plaid prints, the little angled thankful card and the fun flower. awesome LO! Lush LO elaynef, it's a lovely photo and the colours you've used totally set it all off, it's fab! here's my version - better late than never, right? Love it, Linda! What a fun title! Such great colors and grownup patterns. I love the “defrosting 101” as a nod to your dd’s college life. And I literally cringe when I have to defrost my own freezer.